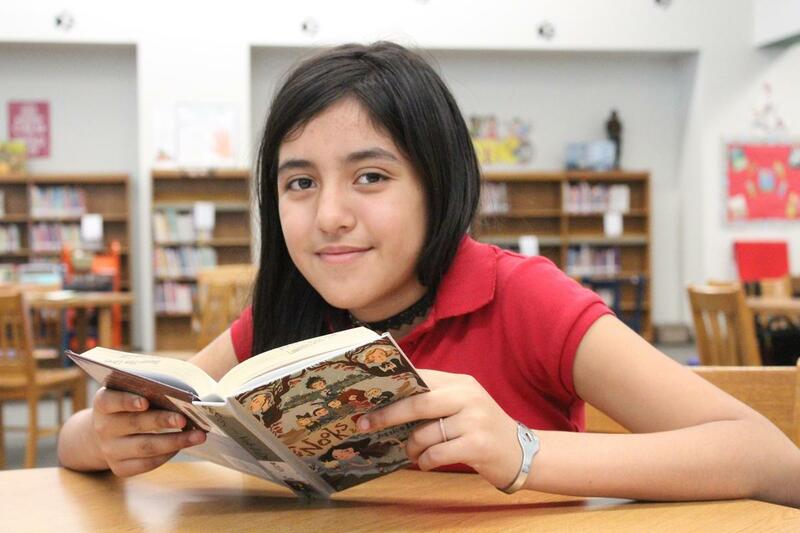 Lancaster, TX/Lancaster ISD – When Lancaster ISD Houston Elementary fifth grade student, Yareli Vasquez, heads to sixth grade next school year, she will be dually prepared for success. As a student who participated in the district’s Bilingual Education programs since Pre-Kindergarten, she has become proficient in both the English and Spanish languages. Now, at almost 11 years old, a confident Yareli understands the concepts of both the English and Spanish languages and can read, write and speak both languages well. She has developed a love for school, her teachers, learning, numbers, math, words and reading books of various types of genres, such as adventure, horror and graphic novels. Lancaster ISD uses a language of the day approach in the bilingual classes and teachers are attentive and meet the students where they are to help them grow to the desired learning levels. This supportive learning environment was a benefit to Yareli. While Yareli’s family native language is Spanish, though at a young age, she was also very familiar with English. Upon enrollment in the early learning programs in Lancaster ISD, her parents made a critical decision when her mother, Eva Vasquez, chose to enroll Yareli in Lancaster ISD’s Bilingual education classes where the teacher instruct students in both languages instead of the English as a Second Language (ESL) courses that focus strongly on English proficiency. Ms.Vasquez is following the same path with Yareli’s two younger siblings who are currently third grade and pre-kindergarten students in the same program. She is very proud of the decision that she made for Yareli because of the growth that she sees in her daughter and the benefit that it is having on her family today. According Lancaster ISD Director of Bilingual Programs and School Improvement Dr. Tonia Howard, the components of the educational programs are designed for the student and the parent to grow and succeed. For the last five years, students who participated in the Lancaster ISD Bilingual and ESL Education programs excelled to become the valedictorian, salutatorian, or ranked in the top five percent of their high school graduating class. Additionally, in 2017, 91% of students passed the STAAR Math and 83% of students passed the STAAR Reading exams, respectively. Currently, Lancaster ISD offer Bilingual learning options for students in Pre-Kindergarten to fifth grades and students can participate in the English as a Second Language Program in all grades, Pre-Kindergarten to twelfth. The students learn in a safe and supportive environment from highly-qualified and certified Bilingual and ESL teachers and enjoy a culturally diverse learning environment with a rigorous curriculum approved by the state. There are also free courses for parents to complete their GED in English or Spanish along with ESL classes. Parents can also gain access to continuing education, pathway to citizenship and better employment opportunities through the district’s partnership with the Dallas County Community College District. For more information on the opportunities available through the Lancaster ISD Bilingual Education programs and ways the district can serve and empower the families in the upcoming 2018-2019 school year, please contact the Special Programs Department at 972-218-1400 or visit the district’s website at www.LancasterISD.org and search for Bilingual Education.